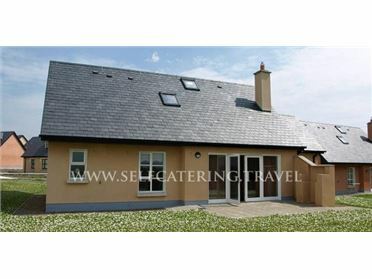 Molly's Cottage is a lovely semi-detached property in the heart of The Wild Atlantic Way, in the coastal town of Lahinch in County Clare. This property sleeps eight people and has three bedrooms, consisting of a double with en-suite shower, a family room with one double and two singles with en-suite shower and one twin. The cottage also has a kitchen with dining area and breakfast bar and a sitting room with with a solid fuel stove. Outside there's parking for 2 cars and a paved patio to the rear with furniture and seating at front of house to watch the evening sunset over the bay. Molly's Cottage is a great family base. The seaside village of Lahinch lies on the shores of Liscannor Bay. With 2km of fine sandy beaches, an 18-hole championship golf course and a further 18-hole coastal course, it is very popular with tourists. There are numerous activities available at the beach including sea fishing, diving, surfing and sailing, or alternatively, take a stroll down the promenade or enjoy a beach walk, plus the village also offers an indoor swimming pool and a children's play area.